Buying A Diamond Engagement Ring How To Get More Bling For Your Buck! The tradition of giving a diamond engagement ring has been around for centuries, but was limited to the upper classes for most of history. In the early twentieth century all that changed, mainly because of the great advances in technology related to diamond mining and diamond cutting. Now, in the twenty-first century, diamond engagement rings are more popular than ever. And with a few pointers, you can get more diamond than you may have thought you could afford. The most important thing when beginning your search for the perfect diamond engagement ring is to know the four Cs of diamonds. The four Cs stand for color, cut, clarity, and carat. To get more diamond for your dollar, you might, for example, exchange carat size for clarity or color. Because these are the most important traits of exceptional diamonds, not carat size as many people think. So when it comes to purchasing a truly high-quality diamond, size really doesn’t matter. Color and clarity rule. But if the size of the diamond in your diamond engagement ring is what matters most to you, you’ll want to consider this: A carat has 100 points. Diamond costs increase significantly once they reach a carat and for each full carat mark after that. So an easy way to save some money on a diamond is to purchase just below the full carat mark. Nine-tenths of a carat, 1.9 carats, 2.9 carats are examples of this simple strategy that could save you major bucks. The same holds true for colored diamonds too, so think about this if you’re considering buying, say, a pink diamond engagement ring. Another way to get a little more bling for your diamond engagement ring buck is to consider a design that uses several smaller stones as opposed to one large stone. 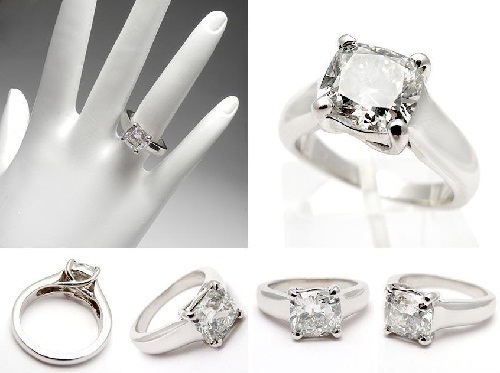 A diamond band is generally less expensive than a solitaire, even when the carat-weight is the same. So you can actually get more diamond-weight for less money. Diamond bands tend to have more sparkle, although they aren’t as prominent as a solitaire that’s waving itself in the air, begging for attention. Having a diamond band for a diamond engagement ring also has the advantage of getting banged around less, and is therefore likely to need fewer repairs over time. Which is good because you want the ring on your finger, not at the jewelry repair shop! Yet another way to save money and get a little more diamond is to go with a slightly lower grade of clarity for your diamond engagement ring. For those interested, this article shows a case study performed between 2 carat diamonds with different color/clarity grades (and yet appear identical to each other) with significant price differences. Buying a diamond set in white gold or platinum makes it look whiter. This can save you a great deal of money and help you purchase a larger diamond than you thought you’d be able to. Finally, flawlessness does not ensure a beautiful diamond. In a well-cut diamond, whether it be round, oval, or heart, shaped, you won’t be able to see flaws – but you will see savings you weren’t expecting.